5 Time AALBC.com Bestselling Book! In Jesmyn Ward’s first novel since her National Book Award-winning Salvage the Bones, this singular American writer brings the archetypal road novel into rural twenty-first-century America. Drawing on Morrison and Faulkner, The Odyssey and the Old Testament, Ward gives us an epochal story, a journey through Mississippi's past and present that is both an intimate portrait of a family and an epic tale of hope and struggle. Ward is a major American writer, multiply awarded and universally lauded, and in Sing, Unburied, Sing she is at the height of her powers. Jojo and his toddler sister, Kayla, live with their grandparents, Mam and Pop, and the occasional presence of their drug-addicted mother, Leonie, on a farm on the Gulf Coast of Mississippi. Leonie is simultaneously tormented and comforted by visions of her dead brother, which only come to her when she’s high; Mam is dying of cancer; and quiet, steady Pop tries to run the household and teach Jojo how to be a man. When the white father of Leonie's children is released from prison, she packs her kids and a friend into her car and sets out across the state for Parchman farm, the Mississippi State Penitentiary, on a journey rife with danger and promise. 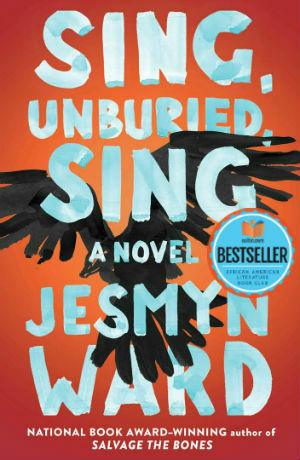 Sing, Unburied, Sing grapples with the ugly truths at the heart of the American story and the power, and limitations, of the bonds of family. Rich with Ward's distinctive, musical language, Sing, Unburied, Sing is a majestic new work and an essential contribution to American literature. Tell us what do you think about Sing, Unburied, Sing .